BARNSTABLE, Mass. 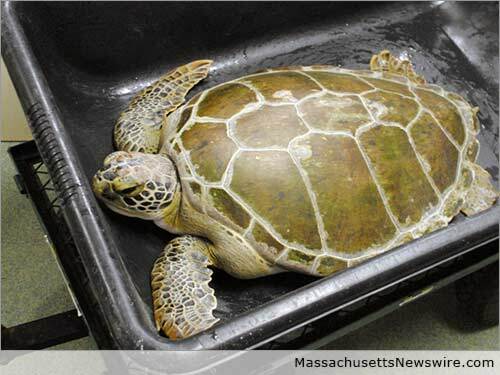 /Massachusetts Newswire/ — Sea turtles were stranded on the Cape in record numbers this winter – more than 1,200 in about a month – many of them Kemp’s ridley turtles, the most endangered turtle species. What caused this flood of imperiled turtles and what steps were taken to save them? Kathy Zagzebski, president and executive director of The National Marine Life Center, will address these and other questions about these fascinating creatures Wednesday, March 18, 2015 from 6-8 p.m. at Cape Cod Beer, 1336 Phinney’s Lane, Hyannis. The event is part of Cape Wildlife Center’s Wildlife on Tap lecture series. A donation of $10 per person in advance or $12.50 at the door will include admission and snacks. All proceeds will help Cape Wildlife Center care for about 2,000 patients in 2015. The brewery’s award-winning beer will be available for purchase. Zagzebski’s presentation is the third in a series of four lectures presented as part of Cape Wildlife Center’s 2015 Wildlife on Tap lecture series. The monthly lectures, each of which will present an expert discussing an intriguing ocean animal, will be held on Wednesday evenings, from 6 to 8 p.m., at Cape Cod Beer. All lectures are expected to sell out in advance; to avoid disappointment, guests are asked to purchase tickets as soon as possible, either in person at Cape Cod Beer, 1336 Phinney’s Lane, Hyannis; at Cape Wildlife Center, 4011 Main St. Barnstable; or online via the “donation” tab on Cape Wildlife Center’s Facebook page. For more information, call Cape Wildlife Center at (508) 362-0111.